Spectrum Marker Generator View of 0 - 10 MHz of RF spectrum, showing 1 MHz markers and 100 KHz markers." National RF, Inc. is pleased to announce the production of a new device, the Type NSG-2 Spectrum Marker Generator. The generator is intended to be used with either spectrum analyzers or communications receivers to mark specific frequency intervals in the RF spectrum. When used with receivers, it is essentially a frequency calibrator, thus making it attractive for use with vintage receivers with analog dials. The NSG-2 provides a leveled amplitude output over nearly 100 MHz of RF spectrum, thus making it ideal to mark frequencies and signal levels on spectrum analyzers. In addition, it may be used with a spectrum analyzer, in lieu of a sweeping type generator, to align lowpass, highpass, and bandpass filters with passbands greater than 20 KHz. The device utilizes digital circuitry in a modified Comb frequency generation circuit to produce three marker signals, 1 MHz, 100 KHz, and 10 KHz, or combinations of the three signals. These three marker signals are reproduced well into the VHF spectrum. 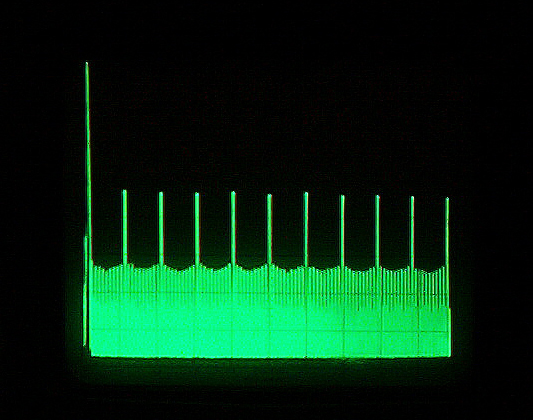 Each marker has its own unique amplitude, thus making it identifiable on a spectrum analyzer display. The approximate power level of the 1 MHz markers are -40 dBm, the 100 KHz markers are -60 dBm , and the 10 KHz markers are -70 dBm. These levels roll off at a rate of about 2 dB per decade, thus giving a reasonably leveled useful output between 10 KHz to about 80 MHz. Above 80 MHz, 1 MHz markers will still be recognizable to about 300 MHz. The spectrum generator retails for $249.95, plus shipping and CA tax. Contact National RF, Inc., at 858-565-1319, or fax number 858-571-5909 for availability. Overseas Customers: Please note that an additional overseas shipping charge will be applied to your order. National RF will notify you of the exact amount of shipping to your country via e-mail, after your e-order is placed. The customer is responsible for all and any customs or tarrif charges applied to your order.